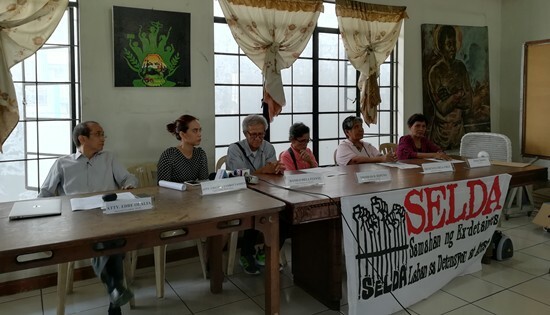 At the press conference of SELDA with martial law victims and lawyers from the National Union of People's Lawyers. Thus said SELDA chairperson Trinidad Herrera-Repuno, as the group is now appealing to extend the validity and availability of funds intended for reparation for martial law victims for those who have not claimed their compensation. About P800 million worth of funds remain undistributed, as many approved claimants were unable to encash their checks. The fund, which is currently with the Human Rights Victims Claims Board’s account with Land Bank of the Philippines, will only be maintained until August 11, after which it will be reverted to the Bureau of Treasury. “We are concerned that many martial law victims from different parts of the country might not be able to resolve these issues before the said date. Ultimately, it would be a disservice and injustice for the legitimate victims to be denied receipt what is justly theirs. It is our responsibility, even when many of us have received reparation, to call on the government to do something to address this,” Herrera-Repuno said. SELDA cited the case of Cresencia Hizarsa, common-law wife of desaparecido Abner Hizarsa, who was a victim of illegal arrest detention under Marcos. Because he was disappeared in 2007, Cresencia filed for claims in Abner’s absence. However, after fulfilling the requirements said to her like special powers of attorney, birth certificates of their children, the check issued to Cresencia was still named after Abner. There is no possibility that Cresencia can encash the check, only when it is named after her. “The claims board has ceased existence, which is why we call on the Lower House and the Senate to support the joint resolution to extend the validity of funds, to give more time to resolve concerns such as that of Cresencia,” said Herrera-Repuno. SELDA is lobbying for both houses to support the said joint resolution. “Umaasa ako at ang aming buong pamilya ng tulong mula sa inyo para makamit namin ang hustisya. Alam kong hindi sasapat ang monetary reparation para makamit ang hustisya para sa amin, bagamat maiibsan nito ang bigat ng aming dalahin at ito'y parte ng tagumpay sa matagal nating ipinaglalaban (Me and my family hope for help from you to attain justice. I understand that the monetary reparation is not enough to attain justice for us, although this may give respite from the burden that we carry. This is part of the victory that we have been fighting for a long time,” said Cresencia.